A quick backstory: I thought I was in total control of my notion of success. At 29 years old, I had a five-year plan. I already had a master’s degree and had a good job that I loved in New York City. I was going to quit my job, spend two years in social work school, and then within three years of graduating get my clinical licensure so I could start my own practice with a focus on therapeutic arts to treat trauma in school-aged children. Then I would have one child at the age of 34, at the earliest, and if I managed to get to it. This was a plan I felt excited about and knew I could execute because I was in control of the plan. 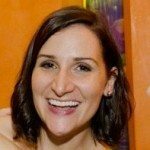 So I quit my job, and started social work school. On the first day of orientation it dawned on me that I had been hungry ALL THE TIME and everything tasted a little off. And then I had some weird dreams that the Internet interpreted as “pregnancy dreams.” I bought a pregnancy test and took it at 11pm on the first day of social work school orientation. And it was positive. So I took another one. It was positive. I called my boyfriend and told him, but told him not worry because I thought the tests were probably wrong! Then the next day I took 3 more! All of them positive! One baby? No big deal. I did not live with my boyfriend so we started to make some basic plans for me to move in with him and we started to talk about expediting our marriage plans. Although I was surprised, I was excited and it seemed very doable. I thought I could just finish my social work program with the baby in tow. No big deal. Everything could proceed as planned. And then everything spun out of control at my first doctor’s appointment. I thought it was a joke. The sonographer asked, “Were you planning this pregnancy?” to which I replied “No!” and she said, “I only ask because there are two.” I started to laugh because I thought she was joking. 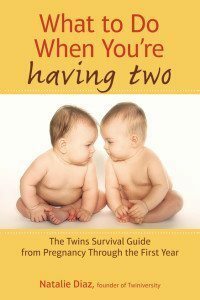 I thought this was some type of sonographer humor – telling couples they had two babies in there – how funny! So I kept laughing and said, “No, really, come on.” And she said, “I’m serious, you can hear their heart beats.” And I heard both of their heartbeats for the first time. Forever etched in my mind was the image of the sonogram line tracking the heartbeats. Each beat sounded so different. I immediately felt like both the luckiest person in the world and the most doubtful person at the same time. This couldn’t be true and even if it were true, I was sure I would have a miscarriage. My then boyfriend and I just cried. The sonographer went to get the doctor and then they clapped for us, while we just sat there in utter disbelief. After the disbelief evaporated it left a residue of fear and anxiety. 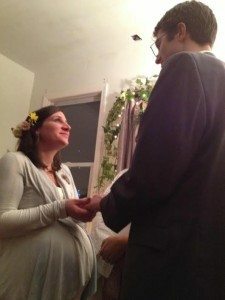 I felt like there was SO MUCH I needed to change and take control of my life with news of my pregnancy. I had to read about how to be a mom! I had to leave my beloved Brooklyn apartment to move to New Jersey! 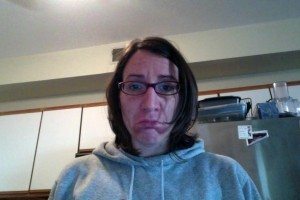 I had to quit my social work program! I had to get married! I had to prepare a one-bedroom apartment for twins! And I was going to do it all in a few months, with two people growing inside of me. I was so afraid to do any of these things because I really believed I wasn’t going to give birth. Because it was twins I was convinced I would miscarry the pregnancy or something bad would happen and they would never be born. It was overwhelming to simultaneously feel I needed to change everything and yet could be giving up everything I had worked for up to that point for nothing if I lost the pregnancy. I found myself paralyzed by fear, not knowing which way to go or how to make the best choices. One of the most difficult choices to make during this time was admitting to myself that I had to stop my social work field practicum and eventually the program altogether. As I had started to debate stepping back from attacking things with the same rigor I did pre-pregnancy, I continuously asked myself: Am I taking the easy way out? Am I letting myself off the hook too easily? What if I just pushed myself a little harder? By me admitting that I could not continue in my graduate program, which was 40 hours of class and practicum a week, plus papers and reading, felt I was absolutely failing. However, as I dug deeper under this idea of failure I realized the real anxiety was stemming from releasing control of my ideas of success for myself. I had a white knuckle grip on what I believed was my future and it was scary to release. I wanted someone to just tell me what to do and how to do it so that everything would work out OK. That just doesn’t exist. This release of control would foster my ability to begin what it feels to truly trust my intuition for the first time in my life. I am the only one who can measure my successes and the “correctness” of my choices. I had to come to terms with this as the pregnancy progressed and my body became huge. I couldn’t do most of what I used to with ease. I couldn’t do anything past 4pm even without starting to fall asleep. I had to deconstruct the person I thought I was to safely make way make way for motherhood. This stepping back was my choice; it was a good one because it was mine and it was the best thing for my babies. As my pregnancy progressed I suspected that my doctor wasn’t the best doctor for my twins pregnancy. Small things like, how the sonographer always told me information from my sonograms, but the doctor never did. The sonographer mentioned once at the start of the pregnancy that the babies were sharing a placenta. NOBODY explained that this made the pregnancy higher risk than having two placentas. Nobody seemed to care that they were growing to be at least one pound apart throughout the pregnancy. So I began to research on my own and discovered that it was actually considered high-risk for babies to share a placenta and that the fact their size difference grew more and more with each sonogram indicated a need for serious monitoring. I tried confronting the doctor about my research in regards to the high-risk nature of babies sharing a placenta, to which I was told to stop searching the Internet and calm down! So, my first lesson as a mama was to learn to trust myself and take control over situation to protect my babies. I left that practice and went to a team of doctors that specialized in handling monochorionic twins pregnancies. This team spent a lot of time explaining everything to me and going over all of my past sonograms. There was a 33% size difference in my babies, which was bordering on unequal placenta sharing and meant I needed to be carefully monitored. My team believed I should deliver them as soon as their lungs where ready for it, which was at 36 weeks. When I imagined giving birth to a baby I imagined doing it vaginally and with very little intervention. When I initially found out I was pregnant, before I knew it was twins, I started watching documentaries about having as little intervention as possible. To me, “C-section” was like a bad word. 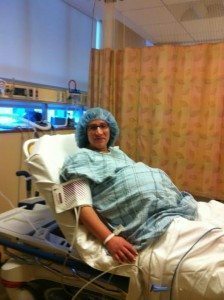 So to elect to have a planned C-section, once again, I felt like I was somehow taking the easy way out or robbing myself of a “real birth.” This however, was the absolute safest option for the babies. Baby “A” was measuring two pounds smaller than baby “B”, which meant if I had a vaginal birth, that would be induced anyway, chances were strong that I would end up with a C-section because of the considerable size difference between the first baby and second baby. I decided not to put my body through an induced labor to perhaps end up with major surgery anyway. My babies would come into this world in a surgery room, not a pool in my living room, and this was fine. I did struggle with this choice a lot, and still do at times. However, it was my choice and it protected my babies, so it was a good one. “This is my song. It is a good song. This was my lesson throughout my twins pregnancy: learning that my choices, my voice, my song, is a good song and although it is vulnerable, it is fierce. It the greatest gift I have to give to my twin boys. They taught me that in the 8 months they grew inside of me. I feel so fortunate that I could release a lot of who I thought I was to grow into mommahood with them. 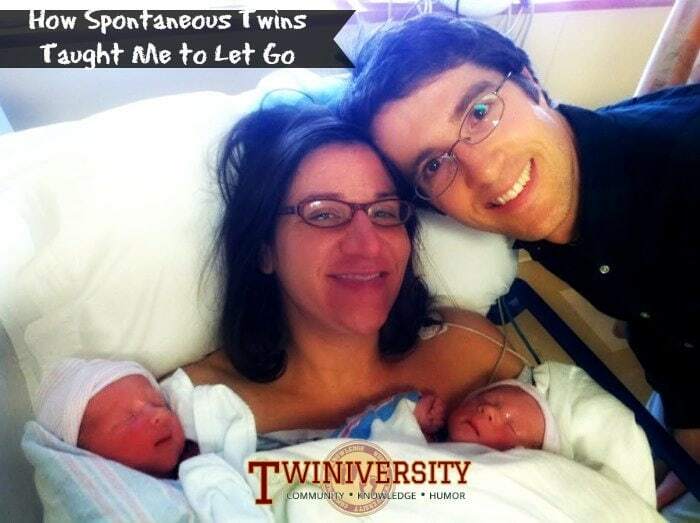 Melissa Ruopp is a mom to two-year-old twin boys. She mainly works for her children, but also consults for an arts access organization in NYC. She enjoys the unending love and partnership of her husband. She is interested in practicing meditation, exploring the role of arts in learning, and trying to see things from her childrens’ point of view.